One afternoon recently I finally got myself together to help Annelise write her thank-you notes. I am embarrassed that these notes were for Christmas presents and therefore quite tardy, but sucked up my guilt and told myself that a tardy note is much better than no note at all. While she worked, I also wrote a few tardy notes of my own (I do wish I was more timely in this area, must really work on that). First, I wrote out a few sentences for each note so that Annelise could copy them. This was the first year I attempted to have her write the whole note herself and I was obviously naive. When she saw the short paragraph she was expected to copy, she looked at me in fear and almost bolted. Uh-oh. Maybe in a another year or two she can write three sentences without me wanting to pull my hair out. We compromised by her writing one sentence and drawing a picture of the gift. And we also took a snack break and a play break. To write six thank-you notes. Thankfully no one screamed or broke anything, so it's all good. Maybe I should look into those fill-in the blank notes for children for the future. 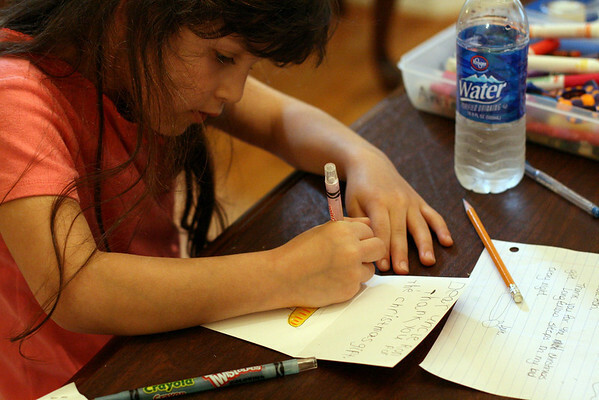 Do you struggle to have your children write thank-you notes? Are you prompt? Do you believe a tardy note is better than no note? Any tips? We are usually late with them but I still send them...I think they are important. I do, however, think the fill in the blank ones are FINE for this age. Ummm...I still haven't sent out thank you cards for my wedding, let alone my engagement party in August, so I think you're ok. Definitely a tardy note is better than no note. Well Luci is a strange child and she enjoys writing thank you's. Griffin, well, it goes like it does at your house. For his Christmas thank you's, I had him write one a day until they were all done. I printed a picture of him that was on the bottom of the page and on the top of the page I typed Dear ________, thank you for the ___________. Then he signed his name and filled in the two blanks. Kind of lame but at least it was a somewhat handwritten note from him. I think it largely depends on the age and the temperament of the child. My eight-year-old daughter is JUST NOW reaching the age where she can tackle a few thank you notes and complete the job without grumbling or constant reinforcements. My six-year-old son has difficulty focusing long enough to write his name on the page. It will take us two weeks to do about five thank you notes. Frankly, I love the fill-in-the-blank options for younger kids, or even letting them draw a picture and be done with it. The point is to get them to understand gratitude, not meet Miss Manners expectations. 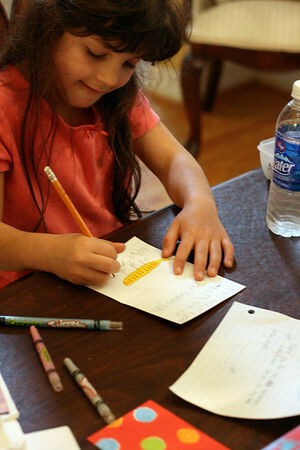 I think it's so great that you're teaching her to write thank you notes! It's never too late to send one, and really didn't Christmas just happen? We haven't done all of our Christmas thank you's either. I am always late with thank you notes, but I do think a late note is better than no note. I have my kids write a few thank you notes, but I write most of them. When I'm really on top of things, I have plain white cards and I write the note inside and have the kids draw a picture on the outside. That way they participate in the project, but no one goes crazy with impatience (i.e. me). wow- all this productivity is fabulous!! Yes- a late card is better than no card & I don't even think this is that late. Thank you cards are hard for kids, but she did great!